1) A random list of features handed down to the product manager to document. 2) A roadmap is not a static document that stays at version 1.0 all year. 3) A secret hid away on SharePoint or some other document management system. “A product roadmap is what describes your current plan of how you will get from where you are today, to the vision described in your product strategy.” Marty goes on , in the same article, and states that “The product strategy analyzes the market opportunity and the technology and describes a vision of what the product can be.” Therefore “The product roadmap describes the sequence of product releases to make the product strategy a reality” (the article goes on to say). The product strategy feeds into and delivers on the company’s business strategy. Taking the above into account means that product managers need to have a firm understanding of the over all strategy of the businesses that they work in. The involvement in the business strategy will vary depending upon the company that you work for, but overall every product manager needs to have a clear understanding of the businesses they are operating in. • Understand the business strategy. • Collaborate with commercial owners, sales, marketing, engineering and business development on developing product strategies to fulfil the business strategy. • Research and come up with ideas and present to stakeholders and arrange a brain storming sessions. • Collate the ideas and work up a strategic roadmap. • Show the roadmap around and get buy-in from budget holders. Using the roadmap as a communication tool. – Developers, Test Analyst and the wider technical team. Communicating the product roadmap demonstrates that the product has a clear vision of where it is planning to go and therefore goes a long way to building confidence at all levels. What is the job of a typical on-line Product Manager? This framework focuses almost entirely on the Development side of the equation. There is no mention of the business focus of Product Management, the cross team communication with Marketing, Sales or the rest of the business. While I have no specific issue with Agile as a software development methodology, WRT Product Management, it's only one part of the role. 2 - Customer engagement. I do mean external not internal customers. I think this is critical and at the absolute heart of product management. This framework seems VERY heavily development centric, yet much of product management is not related to development, but WRT the business side of the house. You might want to extend this to incorporate those other aspects of Product Management responsibility. Agree with your comments - I’m in the process of firming up a few things that will enable me to extend the framework, in a practical way, as you suggest. product Management, the cross team communication with Marketing, Sales or the rest of the business. I really admire this, I mean it really looks interesting! Very nice research. Thanks to the author. The Agile Product Management Framework is nice one to get for work and I think the usage of it is one which now a days has a lot work do on it, such things is to make peopled to do it the work in correct and faster way. 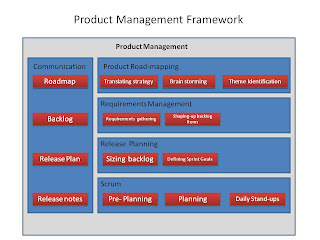 The Agile Product Management Framework, is some thing really nice to get know about and it is good to have such information about the Framework because it is some thing which is in use a lot. Thanks for this informative post, I am learning bit by bit. I see you have a few more post I might want to read later. The Agile Item Control Structure, is a factor really awesome to get know about and it is excellent to have such details about the Structure because it is a factor which is in use a lot.